Lovely rough/natural pieces of Dumortierite in Quartz with that gorgeous blue colouring of the Dumortierite contrasting nicely with the white of the Quartz. These are good sized pieces to work with. 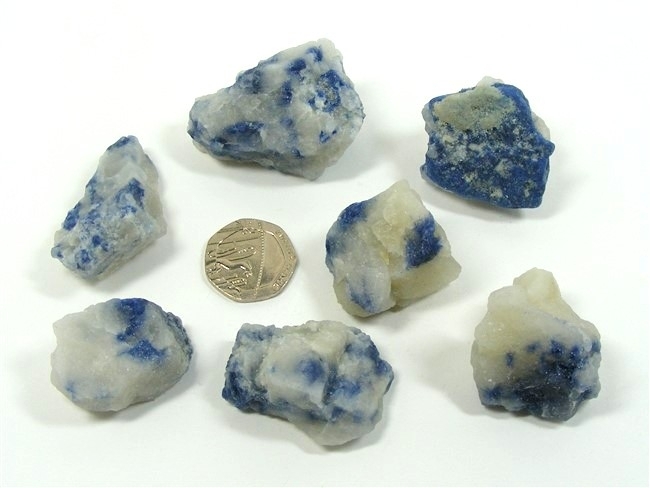 Dumortierite helps us with headaches, nausea, vomiting, colic, cramp and diarrhoea. It can also be of use in cases of epilepsy, palpitations and with wasting diseases. Dumortierite is useful in treating cases of sunburn too. Dumortierite instils within us an instinct for self-preservation, self-confidence and courage. It helps us to stand up for ourselves and to more easily cope with the reality of today. Dumortierite alleviates fear, stress, nervousness and depression, calms over excitability and stimulates patience. It stops us being so stubborn and can help us to develop a positive outlook on life and a love for life. Dumortierite also enhances our organisational abilities and stops us being so disorganised and chaotic. If you deal with crisis, disaster or trauma on a daily basis, Dumortierite helps to focus your relief efforts and provides a calming air in such circumstances. Dumortierite can stabilise a rocky relationship and it helps to attract your life's soulmate. It is said to help you learn foreign languages and is also very helpful in overcoming addictions. Dumortierite makes us much more receptive when we are communicating with our angelic or spirit guides and it helps us to put our spiritual ideas into words. It helps with clairaudience and is a superb stone for those working with past lives as it stimulates regression and enables journeying back aeons in time. It is particularly useful for identifying past life causes of dis-ease.